We love the photo booth. Inevitably the best pictures from any wedding come from, not the professional photographer, but the photo booth stationed in the far corner where tipsy guests act very very silly. Brett Ratner, director of Rush Hour and X-men, has a photo booth installed in his house. After several years of parties...he decided to publish a book of all the candids. Jay-Z, Paris Hilton, Justin Timberlake and many others mug for the camera without the aid of fancy lighting or make up artists. An authentic photo booth costs about $8000. Not cheap. 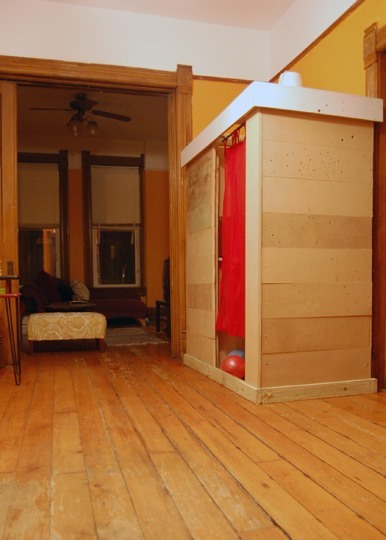 So, it is with great delight that we discovered Apartment Therapy's DIY instructions on how to build a home photo booth. For under $100, you can ask your party guests to document the moment. A link to the Flickr profile would have been nice!